If you are relying on the (not so) graceful chaos of manual posting for your business, you might be feeling a little overwhelmed with all the content you need to plan, produce, share, and share again... and again. If this sounds like your daily entrepreneurial life, then editorial and social media content calendars may just be your solution. What is the difference between editorial calendars and content calendars? 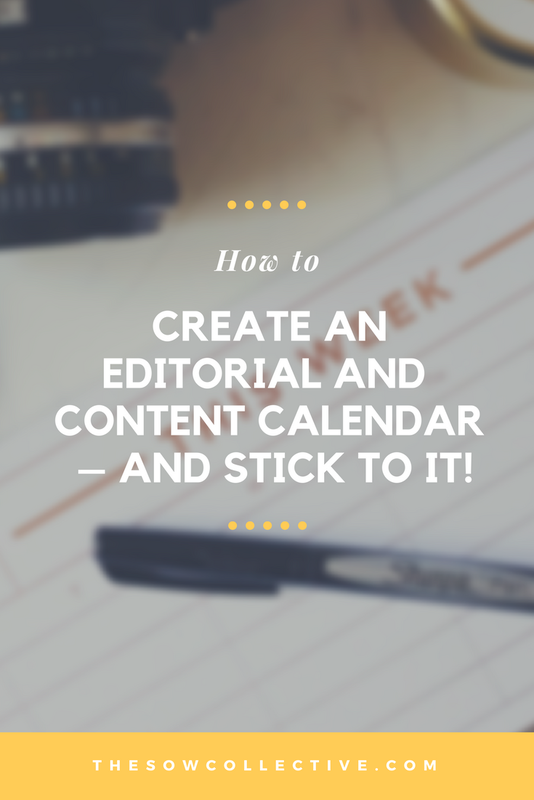 Editorial calendars are a blueprint for your content. If you manage a blog or magazine, it is a way to plan and schedule themes over a period of time to better balance topics. Editorial calendars also offer a prime opportunity to note holidays, seasons, product launches, and partnerships ahead of time, allowing you to better wean your audience into calls-to-action, produce content that is on-theme, and book advertisers. Example: A floral company loves your website and wants to advertise. Refer to your editorial calendar to see where a sponsored article would best benefit them. Reviewing your marketing editorial calendar, you might find that Mother's day is a perfect time to share a sponsored article on unique DIY floral arrangements for mom will fit perfectly. This image is a screenshot of my marketing editorial calendar as it fits my brand needs for 2018. Content calendars, on the other hand, help you share your content in an organized manner. Some professionals like to combine their editorial and content calendars to create a master document -- and that is okay. Either way, content calendars ensure consistency and help prevent you from missing important opportunities for your brand. Note: your content calendar is usually private, while your editorial calendar can be shared publicly for potential advertisers. I enjoy using an editorial calendar year overview for themes (public, one-page PDF), content calendar for social media using Google Sheets, and a Google Calendar for blog and video content. A quick google search for "editorial calendar templates" or "content calendar templates" will bring up thousands of usable templates that you can download to excel, or scheduling software that does the work for you. But if you are like me and haven't found one that suits your needs and business model, then making one of your own is perfect too! Head to Excel, Google Sheets, or Mac Numbers and map out your own calendar as you see fit. I love a month overview, and place each month on a new sheet. My custom social media content calendar in the image above, for instance, leaves room for notes, holidays and hashtags, while color-coding the posts I want to schedule. This is a great method if you have to communicate with employees and interns. For curating editorial content I apply a similar color-coding method per medium (see template screenshot above), but then add it to Google Calendar's month overview for planning the content. I have a digital notebook (Evernote) where I house my "ah-ha moments" while I'm on the go, and then schedule a draft date and publish date according to my editorial calendar themes. After scheduling on Google Calendar, it syncs to my phone, email, and laptop calendars so my daily schedule is always planned accordingly. Even if you designed the perfect calendar, sticking to it will be one of the most difficult tasks. Here are three ways to plan and honor your calendar deadlines. 1. Plan a routine: If you have issues sticking to a schedule, planning your calendar one week ahead may not work for you. For calendar procrastinators, mapping out a content schedule at least 1-2 months in advance will give enough cushion for you to get the ball rolling as you get adjusted to planning. 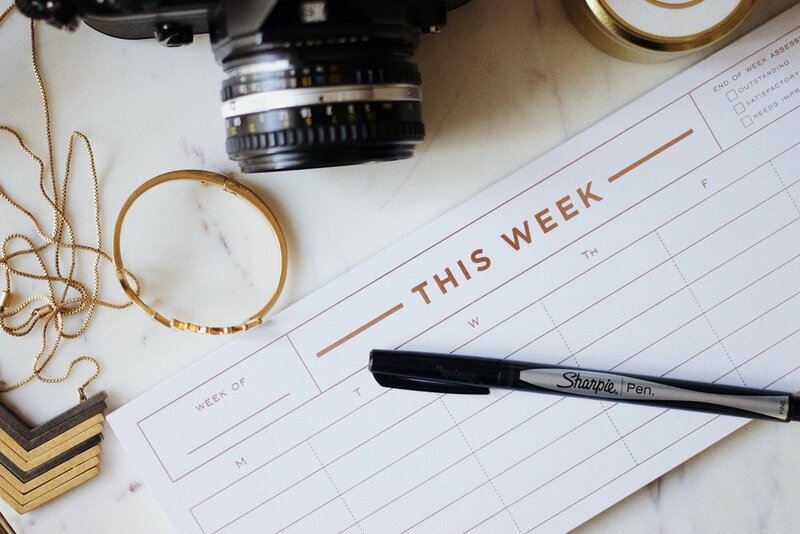 Each day, stick to a routine that allows you to spend a set amount of time building your calendar and be sure to schedule time to carry out those tasks too! Example: Every time I finish a blog post I head straight to the social media calendar to schedule shares across every platform. I often share when the blog post goes live, for 2 consecutive days following the post, and then on custom dates throughout the next 6-12 months. 2. Be realistic and seek accountability: Do you make excuses every time you need to plan? Are you making an excuse about those excuses right now? Calendar management isn't for everyone. If you struggle with accountability, seek out a support system to help keep you on your game. If it is difficult to find someone who understands, join an entrepreneur community and help push each other forward by announcing your goals and claiming your achievements aloud. 3. Reward yourself: Content calendars don't have to be gruesome! If you stick to this you'll likely find the ultimate reward for your dedication is increased traffic, engagement, and a website full of good content (great for SEO) in less than a year. If that's not enough of a reward, treat yourself to a couple of days off for every month you plan and schedule. You'll soon realize that the more you schedule ahead, the more free time you gift yourself. How are you planning your content? Again, there is no right way to build a content calendar. You don't even have to DIY: CoSchedule, Asana, and Trello are a content creator favorites. The goal is to get organized, stay on top of the market, and start planning ahead so that when life happens -- which it will -- your brand and business isn't affected. If you found this article informative, share the wealth with other entrepreneurs and bloggers. These content calendars (whether marketing editorial, blog content, or social media content) are key to productivity and may even help you have a better work-life balance.